We have always had a connection to nature, a tether spun from both necessity and wonder. Our first settlements sprouted alongside their harvests, using nature’s abundance to weave community from those it nourished. In those early times, small, local farms provided all we needed to grow. As generations turned, settlements gave way to cities, and localized agriculture developed in kind. More farmland was tilled, vast supply lines were paved, and revolutionary technologies were developed to achieve a food system capable of serving the billions of us in the world today. With industrialized agriculture seemingly more than fit for the task of feeding the world, do small farms have anything left to give us? At Apeel, we recognize the immense importance of the small farm and are dedicated to enabling small farmers to share their bounty with their communities and beyond, all while ensuring that the quality of their produce represents the best nature has to offer. Small farmers are foundational to a food system that struggles to work harmoniously with them. Over half a billion farmers run small farms. Despite typically operating on small plots of land, small and family-run farms dominate the world’s agricultural land — 87% of it to be exact — and produce 70% of the world’s food (1 Billion: Changing the Food Game). Though small farmers are prolific, their commercial prospects are challenging. For instance, the context in which these small farms operate subjects them to chronic disadvantages: market access, lines of credit, agricultural inputs, effective distribution, and new technologies are only a few of the many obstacles that more frequently come harder for small and rural growers than they do for larger contenders. The Strategic Initiatives Team’s mission is simple. They pursue long-term efforts to establish a more participatory global food system that provides market access and economic opportunities for small and family farmers, promotes the growth of diverse agricultural production systems, and brings nourishment to underserved communities. For the past year and a half, our Strategic Initiatives Team has been focusing on developing and introducing creative solutions and business models that can withstand market pressures, achieve long-term viability, and capture the economic value that Apeel Science’s technology unlocks. With Apeel Science’s new self-service model designed specifically for small farms and small volumes of fruits or vegetables, farmers are able to have longer-lasting and higher-quality crops which, in turn, facilitates new selling opportunities. Our goal for 2019 is to scale our program and bring more farms on board. We love unique and exotic specialty crops! These are the uncommon varieties of fresh fruits and vegetables that make people excited about the produce section of their local store and that inspire greater interest in what we eat and where it comes from. These specialty crops are, generally, underutilized niche types of produce without a very long shelf life, which limits their market opportunities and reach, despite the numerous qualities (like taste or nutritional value) that make their produce unique and — we like to think — more desirable than other more common produce varieties. Despite this limitation, its smallholder production systems that are responsible for keeping many rustic, niche, and climate-resilient varieties and breeds alive. In doing so, farmers play an important role in maintaining much-needed agricultural diversity in the food system, which is essential for food security as well as for the ecosystems upon which global food production depends. Nonetheless, the evolution of the global food system threatens crop diversity: there has been a 75 percent decline in crop diversity over the last 100 years or so (FAO). What’s more, by 2050, one-third of today’s cultivated crop diversity could disappear (FAO), which further increases our dependency on fewer crops, while increasing the global food system’s vulnerability to shocks. By targeting unique specialty and underutilized crop varieties produced by small farms, Apeel drives their profitability and persistence over time, while empowering consumers with a larger range of choices. When farmers are able to ensure greater longevity for their niche produce, new opportunities come within reach. Not only are these farmers able to sell to more or better markets on their own (i.e. via e-commerce or across borders), they can also sell to retailers of all sizes who are hungry for unique offerings to introduce to their customers. With added economic opportunities, small farmers are newly able to sell to more lucrative markets in addition to their local communities. We’ve had great results with our small farm initiatives! While we’re still learning every day, we already have some success stories. 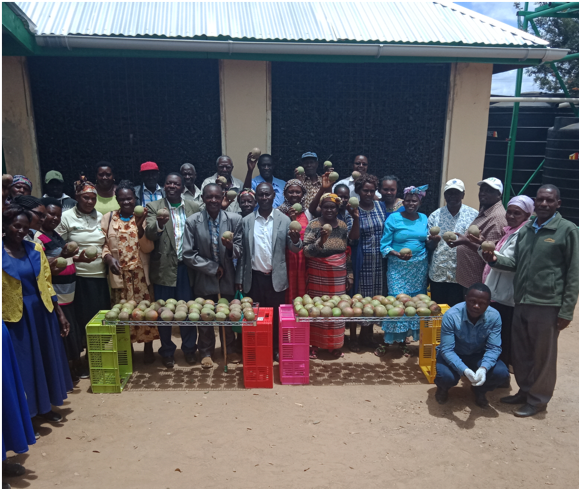 In this case study about our work in Kenya in 2017, Apeel proved to be a valuable solution to common challenges related to market infrastructure. When faced with unexpected logistical challenges during transport from seller to buyer, namely a shipping container whose refrigeration failed, only Apeel-treated avocados could be sold for a good price. The untreated produce was entirely overripe and unmarketable. Not only does Apeel improve avocado quality and extend marketable shelf life without refrigeration, but it also acts as a risk management tool. Additionally, our friends at Good Land Organics in California have been able to begin exporting their caviar limes to Europe, which is something that wasn’t possible when they hadn’t treated this crop with Apeel. As an aside, if you’ve never had a caviar lime, you’ve got to try one. The Strategic Initiatives Team has big things planned for 2019. If you work on a small farm and/or unique specialty produce and are looking to join up with Apeel to help extend your produce’s shelf life or are just looking for more information, please get in contact with us by filling out the business inquiry form on our site. We look forward to hearing from you!